Alright, so yesterday I had a -bleeping- meltdown. I seem to have a problem parting with animals, which as I previously mentioned, all started with hamsters when I was 4 years old. Bastards die. That's not -bleeping- cool. Anyhow, this has been a bit of a rough week. I'm worried about Kitty. I'm worried about Ron. I'm worried about Sticky. Ron is super busy at work and a touch LOT stressed- I think he may be developing a facial tick. His allergies are giving him swollen squishy eyelids and his skin has been "on fire." Also, we've been surviving on -bleeping- juice for now the 9th day. Which, trust me, is not as -bleeping- fun as it sounds. Ron has kindly agreed to give Sticky another week. Perhaps without some of the other stressors and a bit more time, his allergies will diminish. Additionally, I am trying to find us a new casa LaFleur, as we need a place without carpet. Carpets are gross and they hang onto all those allergens. So, we'll have Sticky another week, and I promise not to -bleeping- loose it, if she can't stay. I'll plan on a good ol' fashion cupcake binge and a bottle of wine instead. Cause that's a healthy coping mechanism. Thanks for all the kind messages. Sending virtual hugs. Post Script: these photos have nothing to do with the -bleeping- Sticky situation, they are just a few that I like. A flower at Torrey Pines. Rainy day in Costa Rica. Flowers at the Farmer's Market in La Jolla. 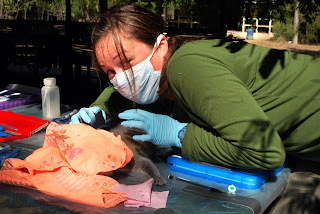 And here I am in 2008 being creepy with an anesthetized lemur. I gotta sneak in hugs when I can! Good update! I hope everything can be sorted out, new casa sans dreadful carpets (they really are horrid for allergies, I have NONE)and Sticky situation improving. Certainly Ron's stress will exacerbate his allergies on top of wee Sticky's dander. BTW thanks to you, I went out a bought a JUICER a few days ago. It's like a new fun toy, as I'm throwing all kinds of veg/fruit items in to see what happens. Won't do an actual fast like you, but will try for a few days to subsist mostly on juice. The question now is: what to do with all that pulp?? People with TIME on their hands suggest making muffins, cakes, crackers, puddings etc. with the pulp but they don't have a giant grant application to write immediately. Oh, and hugging doped-up lemurs? I have a similar photo somewhere from 2003 with Eggy, my favorite lemur from Beza at that time. Ha ha, the juicers are catchy! I had a really crappy one about 10 years ago, but didn't really use it. Anyhow, the pulp seems like such a waste, doesn't it? I suppose you could freeze it with fruits and veg separate. The fruits would be good for baking and the veggies good for cooking with (pasta sauce, mixed into meat things?). I was going to keep it, but then I remembered all the other crap I have in the freezer, that I never get to using. So I haven't been bothering. You doing NSERC again? What a pain. Yes, f'ing NSERC again. Hate it. I'll try your favorite juice. I put apple, tomato, beet, carrot and cucumber together and then mixed a spoonful of raw apple cider, some tabasco, and Worchestershire sauce into the juice for lunch....YUMMY. anyway, keep posting about Sticky. I think you can adopt across the border as I met a woman here who adopted a Mexican hairless from Mexico, and have heard of someone here who adopted a street dog from Thailand, so surely adopting from the U.S. shouldn't be an issue.